We spent four days in total staying in Orebic on the Peljesic Peninsular. 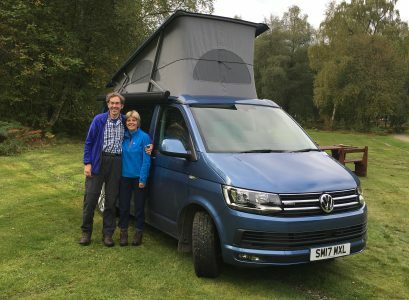 It is the longest we have spent on one campsite since our trip began, and both Howard and I have appreciated the break from constant travelling. We were fortunate to have a few days of good weather, and made the most of the sunshine. Howard and Edward spent one day cycling along the Peninsular, whilst I took the opportunity to get my hair done. I think Edward now has designs on my bike. The following day we took another trip to Korcula, and had a pleasant walk from the town back to the car ferry terminal. One of our Austrian neighbours on the campsite had obviously been observing our seating arrangements at mealtimes. We only had two chairs, so Howard made an impromptu seat out of some plastic storage boxes and a piece of carpet. The Austrians, spying this from their huge ‘big white’, eventually came over with a chair for us to borrow. I think in total, however, Howard only sat in it for less than twenty minutes – we have decided we could never adopt the ‘campsite routine’ of many of our fellow campers, which seems to involve sitting in their reclining chairs for hours on end, seemingly doing nothing at all. Howard, Edward and I started taking bets as to which of our neighbours would have moved from their spots after we had left them for the best part of a day. By and large, none of them had budged an inch – most odd. We then wound our way back to Dubrovnik, and are staying in an apartment here for three nights, within walking distance of the Old Town. Yesterday we took the opportunity to walk the city walls, and also visited the Fort overlooking the walled city. Today, we have spent the day on a trip to Mostar, in Bosnia and Herzegovina. This is the town that became famous in the war in the 90s for the destruction of its medieval arched bridge, that spanned the Neretva River, connecting the two sides of the city. By and large, on one side of the bridge lived the Muslim community, and on the other side, the Christians. The city, which had originally been attacked by the Yugoslav People’s Army, then saw rising tension between the Croats and the Bosniacs within the city, which divided largely along ethnic lines. When the bridge was bombed, it meant that the community was divided, and in some cases, families split up. After the conflict, the ancient bridge was re-built, and has become a powerful symbol of the war. Today, the Bosnian economy has still not recovered, and apart from agriculture and some tourism, investment has yet to return to the country. As a result, the unemployment level is as high as 40% in some areas, and wages remain low. Today Mostar was busy with visiting tourists. Our guide for this part of the trip was a charming lady, born and bred in Mostar, but who had spent nearly a decade in New Jersey, USA. It turned out she was actually a Professor of English Literature, but was earning a living by leading tours of her city. We walked through the Muslim part of the city, which retains it’s architecture from the time of the Ottoman Empire, and walked across the new bridge. The cobbled streets leading to the bridge were filled with stalls and shops selling their wares, many of which wouldn’t have looked out of place in a Turkish Souk. The city is famed for it’s copper and silverware, and Howard took the opportunity to purchase a coffee pot for making that strong Eastern coffee – we will see how it works out on the stove in Oscar. Our guide had recommended a traditional restaurant for lunch by the river. By the time we arrived, there was a small queue for a table. To keep us amused for the few minutes we had to wait, we were brought traditional Bosnian liqueur drinks. The rest of the afternoon is a bit of a blur, save to say that the lunch was excellent, and the liqueurs very strong. Later, driving back to Dubrovnik, our guide commented that he could not even bear to sniff this liqueur because of it’s strength. He was quite astounded, therefore, when we told him that we had downed one before lunch, in addition to a rather good litre of the local Bosnian wine. Needless to say, the journey home was very quiet! But a thoroughly good day. Tomorrow we are off to explore Montenegro. Just so jealous of your description from today’s blog. It brings back happy memories of a wonderful holiday spent in and around that area a few years ago. Glad Edward is enjoying being with you too.